This means according to the video Paul demonstrates a shorted throttle sensor a zero response however I need a confirmation. I did submit pictures of the Haynes wire diagram engine bay id of the throttle body location. Please scroll down to see them. The readings on the mid wire black with green tracer reads 12.36; the light green wire reads 0.01; the blue/ black wire reads 1.67 v. the ref. According to the Haynes wire diagram the blue black wire ground follows the path to the fuel pump, as the ground. The crucial question here is do I jump the 12.36 from signal wire to the ground side wire without a 5 ohms resistor or jump the the 12.36v sig wire to the 1.67 reference wire with a 5 ohms resistor? Do I replace the throttle sensor based on the information given in prior text emails? The diagrams you attempted to post did not post. Are you sure of the Year and Model. The diagrams I have show the throttle position sensor wire colors to be Brown, Yellow, and Lt Green. I bumped it up, and down, a year. I even checked for Camry. They all have Brown, yellow, and Lt Green. 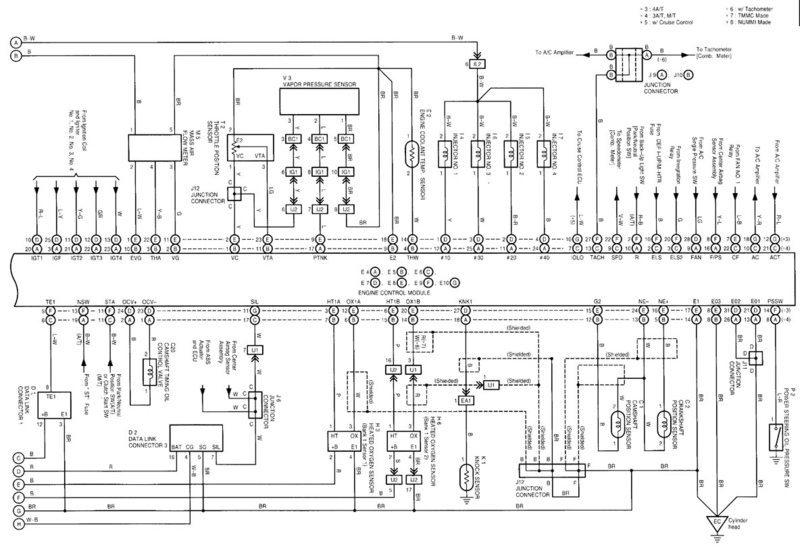 Could you try, again, with posting the wiring diagram, please? I posted it under Tyler. I don't have the chip from camera. Back probed all three wires; the throttle was moved up and down slowly no voltage reading with open and close throttle on each wire. Disconnected throttle connector; the readings on the light green wire is 0.01. This is ground or return signal. middle wire: black with green tracer reads 12.36 volts; this is the signal wire. it did not change when I disconnected the iat, ect, maf, cam and crank. The blue wire with black tracer, reads 1.67v ; this is the ref wire. I thought this was the ground wire because the Haynes wire diagram has a blue black tracer wire going to fuel pump with the ground symbol. They may not be related or they are both related because it goes into the ecm on one side yet I cannot see the other side were it comes out of ecm to the fuel pump..
does it need to be jumped to grd or to ref wire with a resistor? does it need a new throttle sensor after performing the voltage test on all three wires got no readings it is dead when opening the throttle and closing it? Is there another test to verify and confirm a defective throttle sensor? The wire with the 12.36 voltage is way to high above it window range of 0.1 to 0.4. What does your wire diagram design say about the fuel pump color and ground? Why don't you do basic resistance checks on the throttle position sensor, throttle position sensors generally fail by the resistance track failing near the zero position. Last edit: 07 Jan 2019 18:07 by Andy.MacFadyen. Thanks for your response however i did perform the resistance test on all wires while connected. There is no response with open and closed throttle. The volt meter was on direct current 20 v.
Do I have a defective throttle? Do I need to jump with or without a resistor the grd or the ref? Is there another test to confirm the throttle as defective? AG, I don’t understand your response, “the volt meter was on direct current 20 v”. If you were performing a resistance test your meter should be set to ohms with your meter leads connected to the sensor signal + and sensor ground pin - The resistance should decrease as you rotate the throttle plate open. My thinking was not the ohms because turning the key on means battery electrons are traveling through to find its ground with the throttle sensor resistor. This is why I did not use the ohm meter. I did this with each wire; light green 0.01; black green middle signal wire 12.36v; battery 12.60v; blue/black 1.67v with neg probe on battery ground positive probe clip to a paper clip back probing the connector of throttle. I could not distinguish ground from ref; the fuel pump has a blue/black wire going to the pump same color on throttle sensor connector also identified as fuel pump grounded, this is what confused me thinking this was ground according to Haynes wire diagram; so if its ground reading 1.67v, thats is not normal; then the light green I thought was my ref wire reading at 0.1 this was extremely abnormal in my thinking sending ohm current to green wire it immediately read 5v ref. I did send an ohm current to the light green wire it gave me a 5v ref reading; so the middle signal wire voltage was to high meaning it has no ground for electrons to travel towards to drop voltage and complete its loop. how do I trace the problem with this wire's ground short or opening? I did not send an ohm current to middle wire because it has battery voltage . I did not send ohms current to the blue/black wire it has 1.67 volts on it and it was pointing to the fuel pump as the problem because the colors matched throttle blu/blk same as fuel wire i thought they were connected. So, when you say, I need to perform a resistance on the middle signal wire while connected, with key on further confused me. So I have to disconnect the connector checking each pin on throttle body side not connector side, where there is no voltage with the key off. please confirm this fact. I made a mistake never understanding the video on throttle resistance. Why did I get a 5 v reference reading on the light green wire, when I sent an omh current through it; knowing it had a volt reading of 0.01; knowing a mili volt could not damage the regulator? is this just a ghost reading, you call the hall-affect? I have to re-do the resistance test. I have to re-do volt test DC 20v black probe to battery ground and the red lead to clip back probe connector side. then what to do next, jump with or without resistor signal wire to the ref side or the grd side. Do I check open circuit relay. Do I check ground on the fuel pump because my signal wire reads to high 12.36v pointing to zero ground issue. Thanks for the correction, it sounds like good news, that throttle might be good. Throttle sensor is dead . Performed resistance with ohm meter ground wire to ground pin and red wire to signal pin reading 1.814 it was irradic without moving the throttle flap 1.814 to 1.830 and back to 1.814. The reading 1.814 stayed the same unchanged at 1.814 ohms; when opening and closing throttle, it did not increase nor decreased it stayed the same at 1.814. Is this resistance indicating something else to probe? The current travels through all the relays before it reaches the throttle body. should I check the open circuit relay, that delvers a current to the fuel pump? Replacing the throttle sensor will distribute the current to fuel pump and injector and coil on spark plug; car will prime again and start? Please let know your observations. Last edit: 10 Jan 2019 08:00 by andrameda271. Should I replace the throttle first; then see or verify if it will start before checking open circuit relay? Stay humble and thank God everyday for waking up. you just said empty words Balderas. elaborate on your empty statement show your mates how much you don't know. andrameda271 wrote: you just said empty words Balderas. elaborate on your empty statement show your mates how much you don't know. I think you need to first tell us what the initial problem was, why did you start measuring the throttle sensor? Does the car start and run? Have you scanned it for fault codes? I have merged your threads together. Please refrain from starting multiple new topics about the same problem. I understand that you've been working on this problem for a while and that it can be frustrating to not get the advice you're hoping for, but starting a new topic only serves to confuse people who are genuinely trying to help you. By having all of the tests you have performed and symptoms of the car in the same thread a person can read from start to finish and give constructive advice. By having information scattered about the forum you'll end up having to answer the questions over and over again about what tests you've performed and only get more frustrated and further away from a diagnosis. Please don't feel like this is an attack on you, I am merely trying to save you and anyone who wishes to get involved needless agrivation. We are all here to help and learn, all we ask as moderators is to please keep it as organized and civilized as possible.
" Throttle it back" is a miss perception on your part Noah. Since when is a statement of' ,'what is so', perceived as a criticism or an attack, when it's really an observation, of what was said "empty words" inviting Balderas to elaborate and verify his generalized comment which techs must point to the cause and verify. ; you don't need to protect Balderas; he can speak for himself. 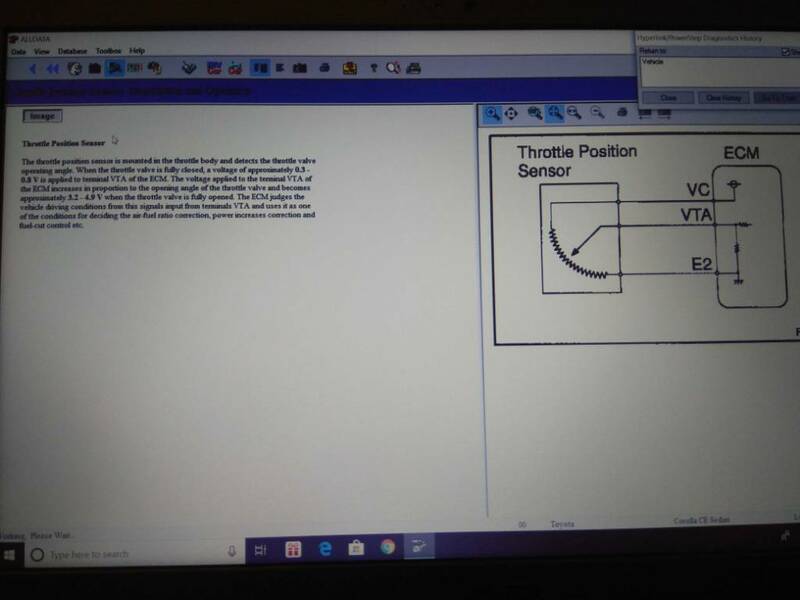 Noah, you invested so much energy on defending a miss perception, that you forgot to answer the question pertaining to the topic, on the new, the resistance test on the throttle reading 1.814 ohms; never changing with open/ closed throttle vent. Stay focused Noah; you might be suffering from an energy leak and a mind miss perception. Don't forget the spirit of cooperation, tolerance and compassion, they must take the lead not your imagined ego dictates of your mind. On top of your creative poetic warning is an obvious threat to my investigations and learning in this forum. you are representing Paul Danner and the Rosedale University. You with held information pertaining to new discovery about the resistance test on the throttle; this was your punishment to me and an insult to Banderas and an ego boost to your imagined occult brotherhood persona; it is not real, although you think it is, that is why you acted as the gang man protecting its soldier when Balderas is just a student not a gang member you erroneously imagined yourself as the image you uphold in your mind's eye, a perfect example of self hypnosis it made you step out of boundary into an illusion you felt you had to protect, at my expense. I know, I am not my emotions nor am I who My ego, who loves to hypnotize my mind into thinking I am some body special or powerful I don't buy into it and never loose my self control; I know I am not my body' strength's or defects, either; I am the pure formless spirit, the invisible " I am Of God, who is implanted in every human being. The only effort I do is very simple, I turn the mind's attention away from the objects of the world from outer to inwardly, looking at the screen, with all the thought forms and images in it. I don't identify with the thoughts forms and images because anything that comes and goes is an illusion therefore it can not be real; that which never changes, the screen, it is eternal and intelligent and can manifest the grace of God's power. MIRACLES ! You and the human race have this gift of being co-creators with the infinite intelligence, why does any body not want recognize it? Why is the human mind out of sorts with this life affirming frequency and life line. Paul Danner, your professor is on the right track, it requires a subtle silence an internal surrender to the inner God. This is why I follow Paul Danner and Ericthe carguy and Scotty Kilmer and MCcuistian ,they do not make men made systems their idealize God, in a corrupt man made system of gov and corporate autocrats assume they are god and we follow them sheepishly becoming their slaves ;these men are serving and empowering you and me the people, they work for God not the New World order. Save your brother hood concept for the battlefield that already implemented and executed behind closed doors. you will be starved, herded, chipped and mind controlled by there organized terror allowing them to put a chip in your body in-order to eat cancer causing food, vaccinated with diseases, what are you going to do? Look within first a simple turning of the attention. Paul is doing it quietly, I am not your enemy.